Let’s be clear for a moment: when we think about industrial living room designs all we can think is about exposed brick walls with big windows and plenty of natural light seeping into the room right? Why not go for all of it? These industrial living room design ideas are going to be the next best idea when it comes to changing your living room! Pendant lighting is one of the best-kept secrets when it comes to decorating your brand new industrial living room. Simple, aesthetically pleasing and easy to find, this will be the brightest idea – pun intended – when it comes to your living room decor. Exposed brick walls seem to be all over the place. Whether they are original or fake the effect of this industrial living room element is a key feature and there’s no denying it. With the right living room wall decor, such as simple wood storage for your books or just to get your life in order, this is a must-have when it comes to decorating a living room. Leather all the way. When it comes to getting the best of both worlds, leather sofas are another must-have if you want to have a proper industrial living room area. Gather some green in the au natural element and some of your favourite wall art and voilá – ready! When mentioning industrial living rooms we need to take into account the lighting. Floor lamps seem to be taking the advantage here and this is the trend you should follow. 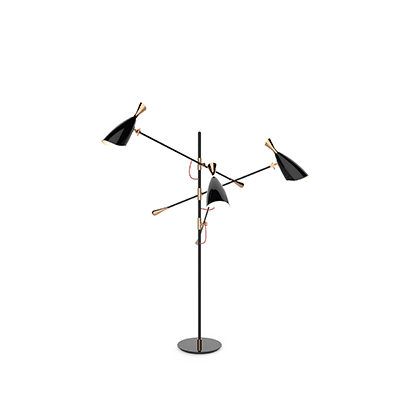 If you need that industrial style floor lamp we’ve got you covered – just take a look into our Editor’s Choice of the day! Diana floor lamp is an exquisite industrial style lighting design handcrafted by DelightFULL. Get to know this industrial piece and their amazing customizations here!